Grizzly H5910 - T-Slot Cutter 5/16"
These 5/16" T-Slot Cutters are made from high speed steel and feature right and left hand helix with side cutting teeth and 3/4" straight shank with Weldon flats. They are used to cut T-slots in a previously cut straight slot. Dimensions indicate nominal width of T-slot or T-nut size to be used (not the actual cutting width). If you are milling Aluminum Plate ,...you will need to mill an extra .060" deep. 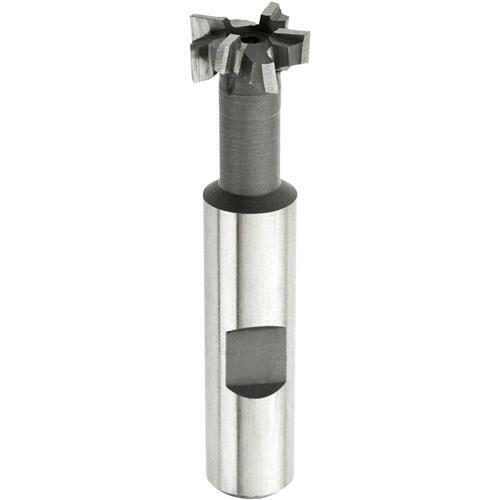 Below your intended bottom geometry , as this cutter is not a center cutting mill cutter , and needs chip relief to ease the cutter through the slot.